The 12-13 of October of 1677 (1307) is intervened by the King of France. The Alliance of the Temple of Solomon creates a military and priestly army in Europe, linking the Crimea with Avignon. With the imperial order, complementary orders were created throughout Europe, such as the Order of Calatrava (1528=1158) in the Spanish orbit or the Teutonic Order (1568=1198) in the Slavic orbit. Over time the orders of cavalry are transformed into noble alliances, military and/or religious, with remarkable economic powers. Orders are the original alliances that will become the future European nations. They are considered the two main orders of cavalry of the Catholic Church. The powers of the Roman Empire, under the initial authority of the Great Khan (transformed into Pope of Rome), are fragmented. The result of the movement of power throughout the 18th and 19th centuries, the Januese Order becomes a hospital order (Order of Malta). The Order of the Golden Spur, founded by Constantine the Great, is a reflection of the Constantinian Order of St. George (1697), which in turn is a reflection of the Order of St. George of Montesa. The orders of St. George of Montesa (1687=1317) and of Christ (1689=1319) are, in the orbits of Aragon and Portugal, the two continuing imperial orders of the Januese Order, and appear on the occasion of the Treaty of Tordesillas (1679=1494). The Habsburg powers (Laskaris Komnenos) occupy Italy, Hispania and Burgundy, and defy the Angelus. With the Gothic lands under siege in the Crimea, Trebizond and Constantinople, Greco-Roman powers moved to the West to take over the strength and authority of the Januese Order. The Angelus take the first step. It is part of the chronicle of Charles of Anjou, which the Official History sends to the past. The Laskaris are following behind. Alliance in Hungary. This order transfers military powers from Hungary to Aragon (= Dragon), and then to the Germanic orbit. It is the root of Habsburg authority. 1614 = 1429 Order of the Golden Fleece. Alliance in Burgundy. The pattern of the order is St. Andrew = Christ = Andronikos. Order linked to the prophecy of the Apocalypse (slaughtered lamb). The founding legend uses a Greek myth: Jason, and the Argonauts. It represents the history of the defense of Christ (Amazon of Georgia, lineage of David and origin of Trebizond, created by the descendants of Andronikos Komnenos) and the trip to the West. It is the origin of the powers of Habsburg (Laskaris Komnenos) in Europe. With the challenge of the Angelus (Anjou), the Laskaris Komnenos, allied with the Prester John (Gran Khan) initiate the definitive transfer of the powers to Italy and Hispania. It is the germ of the Holy Roman Empire (Habsburg), which after the end of the War of Spanish Succession (1714) is fractured. The Order of St. George of Montesa (1687=1317) and the Order of Christ (1689=1319) are created, the powers that in the name of Aragon and Portugal have to reoccupy the Empire. For this reason, diverse world maps show the symbols of Catalan and Portuguese in the distribution of the world traced in Tordesillas. The result of the defeat of the Laskaris (Habsburg) before the Angelus (Anjou-Bourbon) on the occasion of the War of Spanish Succession (1714), creates the false chronicle of the Castilian rights of Tordesillas, and the Castilianization of the Spanish conquest of America. The Constantinian Order, which emerges from the Laskaris Komnenos, is created, and (officially) sold to the Dukes of Parma. In 1714, Philip, the Duke of Anjou, married Elisabetta Farnese, daughter of the Duke of Parma. In 1714 powers are divided between the Angelus (Anjou-Bourbon) and the Laskaris (Habsburg). The genealogical falsification of the Kings of France is created. The genealogical falsification of the Habsburgs is created. In the 18th century the “legend” of the Holy Roman Empire was created, based on the Biblical Israel Kings and the Khans of the ancient Empire. It creates the genealogical counterfeits of the Crowns of Portugal, Castile and Aragon, as well as the genealogical counterfeits of the Habsburg kings of Spain, from the 16th and 17th centuries, which unites them all. The Laskaris of Aragon are manipulated under the figure of the Counts of Palas and those of Ribagorza, also count of Cortes. Hernán Cortés was a Laskaris, the Third Count of Cortes according to the official genealogy. The Order of the Golden Fleece has two leaders, an Anjou (Bourbon) and a Habsburg, from 1714, and the Constantinian Order is integrated to the power Anjou-Bourbon. Thus the Habsburgs and Rome create the Order of the Golden Spur (1744=1559) instead. The father of J.J.Scaliger (named Julius Caesar) was knight of this order (and the patron of Nostradamus). Other notable knights were Mozart, Casanova and Piranesi. The Order of the Golden Spur, the result of deliberate manipulation, becomes a fictitious order sent to the past. The result of a multiple manipulation, in the 21st century it is considered that there are three orders of the Golden Spur: of the Principality of Catalonia, of the Holy Roman Empire and of the Pope of Rome. All three are the same. As a result of the systematic fracture of the powers of the Roman Empire in Europe, throughout the 18th and 20th c. the Constantinian Order was the subject of a dynastic dispute between four families: the Laskaris Komnenos (the native), the Dukes of Parma (excision of the previous one), the Bourbon – Two Sicilies and Orleans (the Angelus=Anjou intruders in Hispania, result of the War of Spanish Succession) and the Bourbon – Two Sicilies Dukes of Castro (excision of the previous one). The Angelus (Anjou), with the purpose of appropriating the symbolic rights of the Constantinian and the Golden Spur orders, create an artificial documentation. Regarding the Constantinian Order, it is decreed that the royal foundation was not from Constantine, but from Isaac Angelus, the successor of Andronikos Komnenos (Christ), in 1190. This is an evidence that points out that the Angelus are really the Anjou (and that Andronikos represents Christ). But the Official History, in the 19th century, turned Isaac Angelus into the traitor of Christ. That is, Judas. Otherwise, regarding the Order of the Golden Spur, artificial documentation is created indicating that is not found by Constantine, but by Charles of Anjou, in 1266. That is, everything points to the Angelus-Anjou. There are three great alternative strengths to the symbolic power guarded in Rome (with the Society of Jesus): economic power (Judaism and Freemasonry), alternative imperial powers (in Europe, China and Japan) and military powers at the service of human ambitions. Union of the Laskaris with the Palaiologos (married with Irene Palaiologos), that grants the rights of the Empire. The year 1638 (1453) falls Constantinople. From this moment a conflict within the Empire is created. The Ottomans extend across the Black Sea, attacking Januese possessions, from Crete to Rhodes. After a civil war in the Arab orbit, the Ottomans initiate the expansion of the Empire from Natolia (Turkey). The year 1645 begins the attack on Candia (the House of Candia is Laskaris, the root of the Scandinavian expansion), in possession of the Republic of Venice. The fight is maintained until 1669, when it definitively falls into Ottoman hands. The year 1663 begins the attack to Austria, and in 1676 to Slav lands. The expansion of 1645-1683 (see below) is the equivalent of the challenge of 1453-1494 (1638-1679) and later, until the year 1535 (1720). The language of Aragon controls all the Iberian Peninsula until 1647 (1462), and is directed by the Principality of Catalonia from 1504 (1319). But on the occasion of the reorganization of powers in Europe, a split takes place. Castile and Portugal are separated from the Language of Aragon. Portugal and Castile are independent and, as a result of a war, the Principality of Catalonia dissociates itself from the Provencal orbit, where the headquarters of the Januese Order is located. Until the year 1647 (1462), the European Januese Order is organized in six Languages: Provence (capital to Saint Gilles, near Montpellier), Aragon, Auvergne, France, Italy, England and Germany. 1579-1599 = 1209-1229 Cathar-Albigensian Crusade. 1628=1258 Treaty of Corbeil. French appropriation of the Catalan domain in Provence, headquarter of the Januese Order. 1640-1659 Reapers War between France, Catalonia and Castile. Duplicate: 1462-1472 (1647-1657) Catalan Civil War. Prince Charles of Viana is Count of Ribagorza (Laskaris). The Grand Master of the Januese Order is a Laskaris. The son of the Count of Palas, faithful to Charles de Viana and descendant of the Laskaris, is the Patriarch of Alexandria. Officially his name is Arnau Roger de Palas. 1640-1668 Independence of Portugal (and of Castile). Duplicate: 1462/1474-1475 (1647/1659-1660) War between Castile and Portugal. The appearance of Switzerland coincides with the decadence of the Januese Order, which carries the financial power that Janua (Genoa) has hitherto owned. Geneva is the new Janua. 1665 = 1480 Andreas Palaiologos (educated by Cardinal Bessarion) attempts to sell the rights of the Empire to the Grand Prince of Moscow, Ivan III, married to Sophia Palaiologos. The management is unsuccessful but house two daughters (Mary and Eutichia) in the Russian orbit. 1665 The Order sells the Antilles base to the King of France, to finance the recovery of the “Holy Land”. They are the same islands that Columbus discovered in his second voyage (1493) – Santa Cruz, San Cristóbal, San Bartolomé and San Martín. In 1665 resources are sought to remake the Empire, intervened by the Turks, and the last crusade is planned, which fails. Look years 1669-1673. 1668 = 1483 Rodrigo Borja buys the Duchy of Gandia. Beginning of the Borja imperial project (Laskaris). With the arrival of the Laskaris to Valencia and Barcelona, ​​the fleeting power of the Counts of Ribagorza (Palas) begins, forging the Borja and Hernán Cortés (Count of Ribagorza-Lascorz) project. The Januese Order, the King of Armenians and Il-Khan Ghazan lose to the Mamluks. St. Peter of the Vatican is founded in honor of Batu Khan, the founder of the Russian Gold Horde and grandson of Genghis Khan, who in the 13th c. (15th) occupies Europe from Russia. The date of the zodiac that is in the Vatican’s Room of the Pontificates transcribes the date of June 24-30, 1670, when it officially takes place between 1513 and 1521, being one of the six rooms that Rodrigo Borja (officially) occupies. This dating dates back to 1670 (=1485), a year before the symbolic dating of the Apocalypse, which dates back to 1486. ​​They are related facts. The King frees the Catalan peasantry from the feudal system to the abuse of the nobles. At the same time, the King plans Columbus’ voyage to America and frees the obligations of the peasantry with the nobility. Admiral Columbus (La Cavalleria-Laskaris) announces the project (Januese) to recover the American headquarters of the Antilles, and to defend American cultures in the name of the Empire. 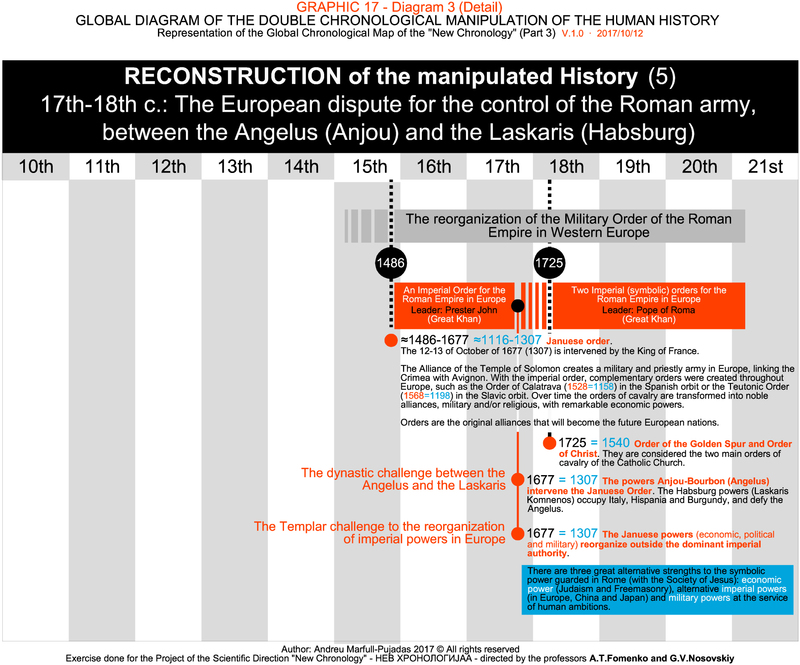 The reconstruction of the Alliance of Solomon is planned, on behalf of the Prester John, to promote the “papal” project and challenge the powers “usurped” by the Angelus. The King John of Portugal (officially) plans an expedition to propose an alliance with Prester John (Great Khan in Ethiopia, guarantor of the Ark of the Covenant, of Solomon) to combat the Ottoman “challenge”. Officially, the Laskaris deliver the powers of Byzantium to the King of Aragon (in Valencia). But it represents the dynastic union with the Laskaris. The donation coincides with the legend of Roger de Flor and the myths of St. George and Constantine. 303 = Saint George dies defending Christianity. 1304-1305 = Roger de Flor (=George) is Caesar. 306 = beginning of the empire of Constantine the Great. 1306 = Donation of Constance (=Constantine) from the Roman Empire to the King of Aragon (Laskaris). America is not discovered, it is a symbolic landmark that refers to the exact 185 years of chronological manipulation between 1307 and 1492. This marks a new era (year 7000 from Adam), and precedes the reoccupation of the Templar base of the Antilles by the Admiral Colon. Admiral Columbus recovered the base of the Antilles, which the King of France (Angelus = Anjou) bought in 1665. The recovery of the Antilles base is done at the service of the Laskaris (Habsburg), with the authorization of the Pope Borja. Through Joannes Andreas Laskaris, Andreas Palaiologos “gives” the rights to the French king, who occupies Italy, in exchange for recovering Morea and Constantinople. Pope Borja, Alexander VI, Duke of Gandia (city owned by the Laskaris since 20/8/1296=1666), gives the rights of the Empire to the Laskaris, who control half Europe. The year 1697 (1494), a friction takes place between the Angelus and the Laskaris, for the control of the Empire. The King of France invades Italy (and Naples) and forces Joannes Andreas Laskaris to sell him his rights. In return, Rodrigo Borja, Pope of Rome, defies the pretensions of the Angelus (Anjou-France) delivering the rights of the Empire to the Laskaris (Habsburg), that they have the power in Hispania. The enterprise is directed to the powers of Aragon, ally of Castile, and of Portugal, after the division of the kingdoms in the previous treaties of Alcáçovas (1479=1664) and Lisbon (1668). The Columbus and the Count of Ribagorza were imperial family Laskaris. Fernando Sanseverino i Aragó, III Count of Cortes, was Hernán Cortés. The Official History has hidden the struggle for the control of the Caribbean between the knights faithful to the Angelus and the faithful to the Laskaris, as well as to the Arab knights. The Ottomans occupy the Holy Land, from the Crimea to Egypt, to restore the order. The Ottoman occupation reinforces the Hellenic alliance in Europe, and the struggle between the Angelus and the Laskaris. The pulse assumes the climax in 1721 (=1536), with the Franco-Ottoman Alliance representing the beginning of a balance that will allow the expansion of the Gregorian calendar. 1681 = 1311 Dissolution of the Templars – The Pope dissolves the Order of the Temple of Solomon. 1683 September 12, Siege of Vienna. The Ottomans attack Vienna. Formed by Austria, Venice, Poland, Tuscany, Russia and the Januese Order, to combat the Ottoman expansion. The war ends with the Treaty of Karlowitz, in 1699. The pulse between Slavs and Turks, where the Habsburgs (Laskaris) are allied, represents the reunification of the powers of Hungary and the beginning of the Holy Roman Empire. Attack to the financial headquarters of the Januese Order. 1499 (=1684) France occupies Janua, until 1528 (=1714). 1684 = France bombs Janua. It recognizes the independence of the Swiss Confederation, the Januese refuge, of the imperial aspirations of the Habsburgs (Laskaris). This Treaty is imposed from the orbit of the Angelus (Anjou, France), after submitting Northern Italy. French occupation (Anjou = Angelus) of the finance capital of the Januese army. 1713=1528 When the Habsburgs (Laskaris) recover Janua, the Treaty of Utrecht is agreed. European coalition to fight the Bourbon-Anjou challenge (in 1689 England is added) = Habsburg League (= Augsburg, Augustus). With the challenge Angelus (Anjou-Bourbon), and in fulfillment of the Treaty of Tordesillas, the .Great Alliance reorganizes the Januese Order and moves the armies to Valencia and Portugal, for the control of the Mediterranean and the Ocean. 1687=1317 Order of St. George of Montesa. Headquarter in Xàtiva (Valencia), city of the Laskaris (Habsburg), associated to the Borja (Gandia = Candia). 1689=1319 Order of Christ. Headquarters in Tomar (Portugal). Objective: to recover the Greek Empire, Morea, Thrace and Constantinople. Beginning of the imperial project led from Catalan lands, by the control of the Greek Empire, Italy and all Europe. MANIPULATION: The Dukes of Athens and Naupaktos (not Neopatria), were the Laskaris. The chronicle of the kings of Aragon as Dukes of Athens and Neopatria is later written, concealing the ownership of the Laskaris. 1688-1697 War of the Great Alliance. Continental War in Western Europe against the Bourbon and Jacobin English. It ends in 1697, after the Bourbon occupy Barcelona. 1503-1512 (1688-1697) “Creation” of the Papal States. First he submits to Venice, then to France. 1511-1512 (1696-1697) Holy League = European Coalition against the King of France. Treaty of peace between France (Angelus) and Aragon (Laskaris). Officially, the King of Aragon obtains the title of King of Jerusalem and of Naples, that grants him Germana de Foix. Officially three marriages are agreed. It joins the lineage of the King of Aragon with the Foix. MANIPULATION: Foix is ​​an invented lineage, which means “Faith”. No ancient map identifies them, and hides the Byzantine powers of the Laskaris. The lineage of the Aragon/Ribagorza with the Borja/Candia are joined. Married Leonor of Milan and Aragon (granddaughter of Alfonso de Ribagorza and Cortes and daughter of Count of Albaida), with Jofre Borja (son of Rodrigo Borja, Pope Alexander VI and Giovanna de Candia del Cattanei). MANIPULATION: the Candia are the Laskaris, and the Borja thus reinforce the family alliance, through the Counts of Albaida. NOTE: possibly transmission of powers to the Dukes of Alba (officially they were Mozarabs of Toledo, unofficially the Alba were Komnenos princes). The lineage of Ribagorza (Lascorz, Laskaris) with the Sanseverino (Prince of Salerno, Naples) are joined. Marina d’Aragó (daughter of Alfons d’Aragó, count of Cortes and Ribagorza) married with Roberto Sanseverino. The Sanseverinos are, since the time of Charles of Anjou (13th c.), Bailiwis of Jerusalem. It is a marriage equivalent to that of the King of Aragon and the Foix that represents the delivery of the Kingdom of Jerusalem to the imperial family of Aragon. MANIPULATION: The Sanseverino and the Anjou of the 13th century actually correspond to the events of 185 years later, which should in fact be 370 years later (twice 185). The son of the Ribagorza (Laskaris) and the Sanseverino is Ferran, Count of Cortes. It’s Hernán Cortés. It assumes the powers of the Empire in the name of the Laskaris, and it is proposed to reoccupy the Mexican dominions, following the project initiated by Columbus (La Cavalleria, also a Laskaris). The uncle of Fernando Cortés is Alfonso d’Aragó, the Patriarch of Jerusalem and Great Prior of the Holy Sepulcher. The Ribagorza (Laskaris) occupy the maximum powers of the Januese Order in the Principality of Catalonia (Grand Priory of the Crown of Aragon, officially). The son of Pope Alexander VI (Borja) and Giovanna de Candia (Laskaris) is persecuted and died in Viana (Navarra). Cesar Borja declares Caesar of the Empire (rights of lineage Candia=Laskaris, that the Official History does not recognize). The Habsburg (Laskaris) domains are renamed the Holy Roman Empire of the German Nation. With the Ottoman expansion, the project of the Holy Roman Empire is created. From this moment the genealogical project of the Habsburgs is created. 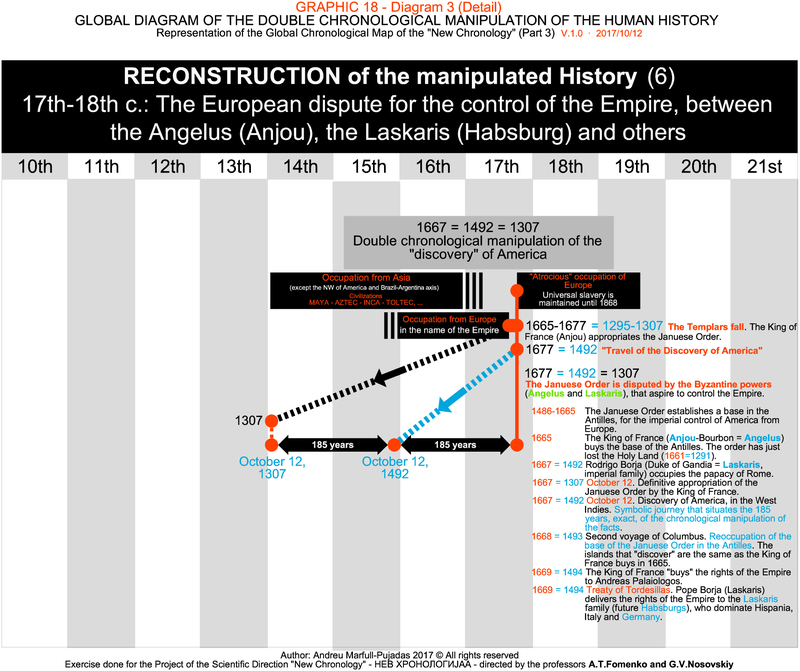 The genealogical work of the Habsburgs carried out by the team of the New Chronology shows that the Holy Roman Empire practically did not exist, and took place at the turn of the 17th and 18th centuries. Joannes Andreas Angelus-Laskaris sells the rights to the Byzantine powers of Tuscany. Unofficially, the order is known as Order of Constantine the Great, and has been claimed by the Laskaris ever since. NOTE: In the year 1494 (=1679), Joannes Andreas Laskaris gives the powers to the King of France. In 1697, Joannes Andreas Laskaris-Angelus hands over the powers to the Duke of Farnese, who in 1714 hands them over to the Bourbon-Anjou, French. They are the same character. The Habsburgs agree on a partition of Europe with the Bourbon and King William III of England is recognized. Officially, it coincides with the negotiations of the will of Charles III of Habsburg to the throne of Spain, that deals between Habsburg and Anjou-Bourbon. This is the Laskaris – Angelus litigation. Raimon Perellós Rocafull is the Grand Master of the Januese Order (officially of Saint John). The Rocafull are direct family of Eudoxia Komnene (historically linked with Andronikos Komnenos, Christ), and the Laskaris Ventimiglia. Probably, the Rocafull are, decades later, the American Rockefellers. The Ottomans are retired. Russia occupies Crimea; Poland recovers Ukraine; Venice gets Morea; and the Habsburg Empire (Laskaris) obtains Hungary (officially retrieves it). Beginning of Ottoman rule in the Holy Land (from Constantinople to Egypt). The Ottomans, with the withdrawal of the Greek and Slavic power, take part in the symbolic and military center of the Empire: the Mamluk dominion that guarded Egypt and the Holy Sepulcher, after having occupied the political capital, Constantinople, in 1453 (1638). In 1526 (1711) they recovered the Kingdom of Hungary, and in 1529 (1714) they returned to siege Vienna. In 1535 (1720) they agreed an alliance with France (the Anjou-Angelus). Fernando Sanseverino i Aragó, III Count of Cortes (Hernán Cortés = Laskaris) occupies the capital (Mexico, Tenochtitlan). Mexico City is represented by the Ottoman and Horde troops, and is a consolidated city. The traces are erased and the Official History distorts the story. Western European War against the Bourbon. It ended in 1714, when the Bourbon occupied Barcelona. 1704 Covenant of the Vigatans. The Principality of Catalonia accepts the English proposal to combat the Bourbon (Anjou) in Hispania, defending the rights of the Habsburgs (Laskaris). 1704 Anglo-Catalan occupation of Gibraltar. 1704=1519 Chapter of the Order of the Golden Fleece in Barcelona. The Burgundian powers of the Habsburgs are allied in Barcelona. 1705 Pact of Janua (Genoa) between the English monarchy and the Catalans, in the War of Succession. 1705=1520 Charles I of Habsburg proclaims King of Aragon in Barcelona. 1706 Charles III of Habsburg proclaims King of Aragon in Barcelona. The Chapter of the Order of the Golden Fleece in Barcelona took place in 1704, not in 1519, and represents the Alliance of the imperial powers of Burgundy (Habsburg = Laskaris) against the challenge Anjou-Bourbon (Angelus). 1521 Revolt of the Comuneros. Occupation of Castile by Charles I. Officially, between 1520 and 1521 Castile is revealed against the Habsburg king (=Laskaris), and in 1521 a war breaks out where King Charles wins. Officially, capitulates the political elite of the Castilian cities. 1706 Occupation of Castile, by Charles III, including Madrid. Officially in 1706 the troops of the Archduke Charles III of Habsburg (=Laskaris) occupy Castile, from Portugal, and later Philip V of Bourbon (Anjou=Angelus) recovers it. From this moment Castile is reorganized integrally serving the new king, who implements his imperial model. 1522 Revolt of the Germanies. Siege and capitulation of Xàtiva. Murdered a grandson of the King of Aragon (denied by official historiography). A Perellós defends the city (and a Perellós is the Grand Master of the Januese Order 185 years later). 1707 War of Succession. Siege and capitulation of Xàtiva. After the victory Anjou in the battle of Almansa, Xàtiva is attacked. The suitor Anjou makes an exemplary punishment, executing and/or deporting the Habsburgs and burning the city. Officially, in 1701 Philip V enters to Spain, and the year 1516 does it Charles I. Officially, in 1706 Philip V reoccupies Castile, and Charles I does it in 1521. Officially, in 1707 the king besieged Xàtiva, and in 1522 also he does it. In both cases there are 185 years of difference. It’s the same story. In 1707 (1523) the Ottomans occupy Rhodes. The year 1707 (1523) created a crisis of legitimacy, which led to the election of a new leader, in 1710 (1525). May 16, 1525, recognition of the rights of Joannes Theodoros Laskaris, as Grand Master of the Constantinian Order, by the S.P.Q.R. March 27, 1710, recognition of the rights of Joannes Theodoros Laskaris, as Grand Master of the Constantine Order, by the Emperor of Austria-Hungary, and annulment of the sale made by Joannes Andreas to the Duke of Parma in 1697. Officially, Joannes Theodoros of 1710 was named Johannes Theodoros Laskaris Flavio Komnenos Palaiologos, and was married to Mary Cantacuzino Komnene, daughter of John Cantacuzino and Anne Komnene. With this union are united the main Byzantine lineages. It is remarkable that more than two centuries after the dismantling of Byzantium this conjunction takes place, unless the facts actually occurred 185 years later. 1717-1714 Treaties of Utrecht and Rastadt, end to War of Succession. Northern Italy is in the hands of the Habsburgs (Laskaris). 1528-1529 The Habsburgs = Laskaris recover Janua and Florence, in northern Italy, which was occupied by the Anjou = Angelus. MANIPULATION = The wars of Italy are separated from those of Hispania, in 185 years. But they are the same international conflict: the control of the Empire in Europe. End of the War of Succession, with the Anjou-Bourbon and the Habsburgs (Angelus Vs Laskaris). The heiress of the rights of the Constantinian Order marries the suitor Anjou (Angelus). The Bourbon-Anjou lineage is maintained through the Farnese. Joannes Andreas Angelus-Laskaris had a daughter, Laura Angelus, and it is probable that the Farnses were, indeed, a hidden root of the Laskaris. Shield: Blue Lis flowers on gold. The treaties of Utrecht and Rastadt represent a challenge to the Ottoman Empire, which attacks the newly created Holy Roman Empire. against the Anjou-Bourbon (Hispania) and the British Jacobites, for the control of Sicily, Sardinia, Parma and Tuscany (Medici and Florence). The Holy Empire, the Savoy, the Netherlands, France and Great Britain are allied. 1717 Treaty of The Hague. Triple Alliance with the Netherlands, France and Great Britain. 1718 Treaty of London. Quadruple Alliance. The Holy Empire adheres. 1717-1720 War of the Quadruple Alliance. 1720 Treaty of The Hague. End of the war. Change of properties for the control of the Empire from the Italian orbit. The Anjou (Angelus) established in Castile renounce Sicily, Sardinia, Parma and Tuscany, but not to the honor of the Constantinian Order. The Habsburgs and the Savoy (Laskaris) regain authority in Italy. The Treaty of The Hague of 1720 is reaffirmed. The Catalans contacted Vienna and Genoa with 17 letters to negotiate the recovery of the rights and privileges abolished in the Nueva Planta Decree (1716). The Alliance does not find a solution, and begins a cultural struggle of the Catalans within Spain to regain their status of Nation and institutional respect that lasts until the 21st century. 1720 (1535) Hernán Cortés (Laskaris, Prince of Salerno and Count of Cortes) is left with a symbolic charge in Mexico, which with the chronological manipulation of the 16th and 17th centuries end up losing. The Viceroyalty of New Spain is created in Mexico. 1721 (1536) The Columbus (Laskaris) obtain symbolic charges in America, and lose the rights of the Viceroyalty. With the chronological manipulation of the 17th and 18th c. lose everything. Probable hidden lineage: the Colonna (Princes of Salerno, in Naples). After decades of struggle between the Laskaris and the Angelus by the control of the Empire, the second (Anjou) are imposed in France and Spain. As a result, the Laskaris powers move to Vienna and renounce rights over Spain. The dispossessions of the Cortés and the Columbus are a direct consequence of the treaties of peace of 1713-1720. A geostrategic alliance maintained until 1801, with Napoleon in Egypt. The Franco-Ottoman alliance does not begin in 1535 nor is it maintained for more than two centuries. It begins in 1721, within the framework of the peace concord that ends decades of an intense fight for the control of the Empire. The Napoleonic project will be the last episode. The pretensions of the Angelus (Anjou) and the (Habsburg), on Italy, on the Constantinian Order, on Parma, Tuscany and the Italian islands are divided, and the British occupation is maintained in Minorca and Gibraltar. This “concord” sets the basis for a “great alliance of peace“, which involves the compulsory sharing of empire power and facilitates the European colonization of the world, in a project led by various centers of power, such as Freemasonry, the Vatican (with the Society of Jesus) and the Roman imperial powers (Monarchs). According to this approach, only with this “concord” can a New World Alliance of the Empire be promoted, able to modify History in its sense, altering the chronology again. They invent 185 years to reconstruct and dissolve the trace of the real history, maintaining the myth of Christ, the unquestionable symbol of the Empire. The year 1719=1534 is founded the Society of Jesus in Paris (1725=1540 in Rome), after having accumulated the Libraries and the Almagest created in the Holy Land, thanks to the dominion of the Anjou on the Januese Order. With the control of the Sacred Texts (the History of the Empire) the ambitious project of rewriting History and creating a new worldview of the past, which pretends to be a global project, is proposed. A balance of powers is created in Western Europe, where the Society of Jesus and the Pope of Rome become two agents forced to understand each other. The former controls the Sacred Text and History, the latter is proposed as a renewed Great Khan, but with a weakened power, which the Habsburg (Laskaris) and the Anjou (Angelus) do not yield. 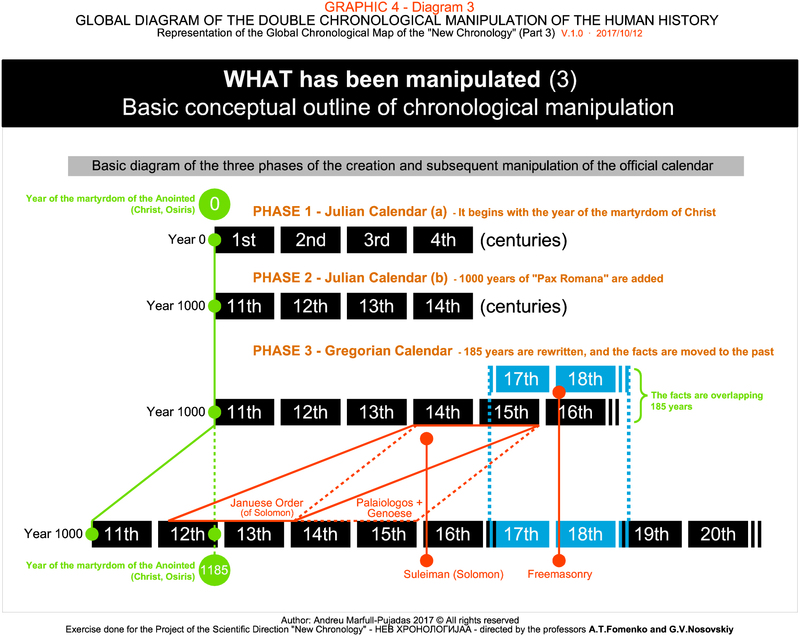 Thus begins the journey of the reconstruction of History on a large scale: the Gregorian calendar. Thus begins the religious pulse, the last great Christian reform, in Europe. Together with the Society of Jesus there appears the evangelistic movement that defies the authority of the Pope (the Prester John sent to Rome, ie the symbol of the Great Khan). Thus begins the last attempt to avoid the definitive division between the Koran and the Bible.